Experience this special place with a walking tour of the wetland and riparian areas at the future Nicomekl Riverfront Park. The City of Surrey and PFS Studio’s Kelty McKinnon and Simone Levy will lead groups to four stations that are part of the Park Master Plan. Wetlands provide habitat, natural filtration, flood mitigation and ecosystems services, all which improve our city. Despite these super powers, urban wetlands are under constant threat. This event will promote a meaningful discussion about the values and threats on urban wetlands and how we can protect and grow our city in harmony with these special places. 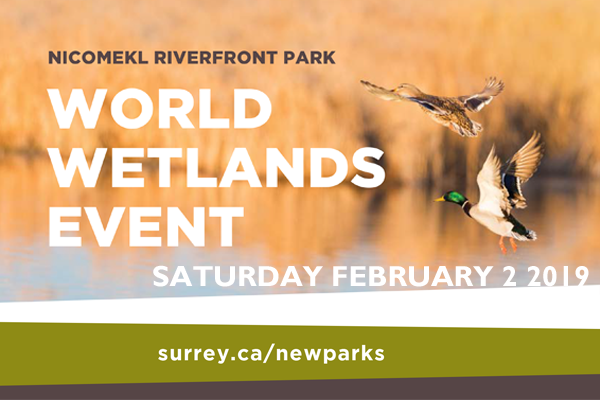 Inspiring individuals to get involved, and encouraging involvement and discussion at all levels, we hope you can join us for this special event on Feb 2, internationally recognized as World Wetlands Day.